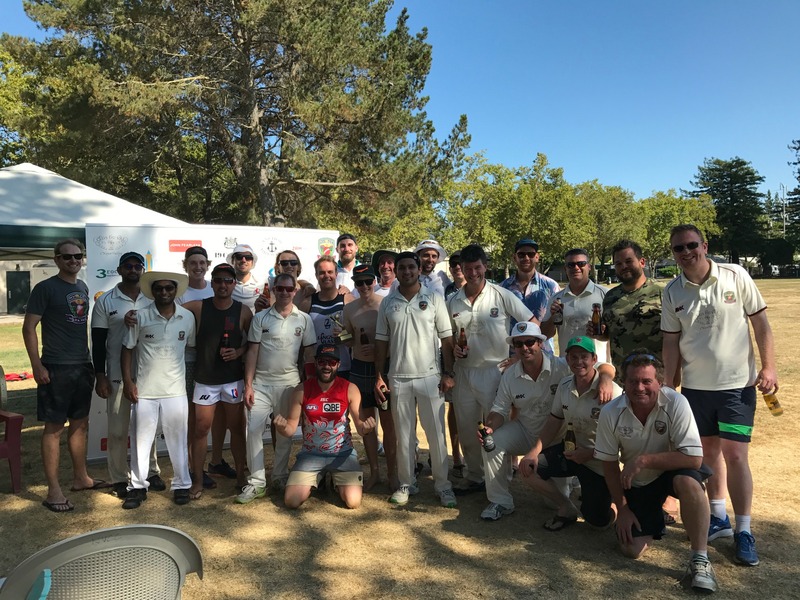 A busy season for the Napa Valley Cricket Club (NVCC) continued as they hosted the San Francisco based Seals recently at the Napa Valley Expo in downtown Napa. While the Seals only play a handful of matches each season they showed all of their skill and ability with a comprehensive victory over their hosts. Each year the NVCC and Seals play for the Vino Cup, a trophy inaugurated in 2014 for the annual match between the two teams. Having lost his seventh consecutive toss of the 2017 season NVCC captain Bernie Peacock and his team were put into bat. Given the forecast of 100-degree heat for later in the afternoon, it wasn’t a surprise to Peacock that his team would be in the field in the afternoon heat. To open Peacock sent out Martin Mackenzie partnered by Tim Marshall who was finally able to don his whites for a match having been injured in the spring while on vacation. Mackenzie laid down an early mark with a four off the first ball of the match but he couldn’t maintain with strong batting and was caught shortly afterwards by Cooper Lees off the bowling of Luke Ingham. 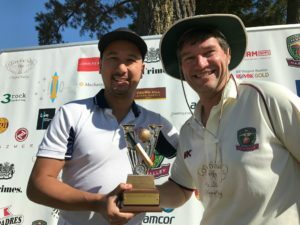 Marshall played a watchful innings and stuck around to face 41 balls however in an effort to push on and up the scoring rate alongside fellow batsman Adriaan Foot he was undone by the bowling of Sammy Davey to a catch by Jack Lucas, for 17 runs. That brought Harjit Singh to the middle for the NVCC and he dropped anchor to steady the NVCC innings which was starting to look shaky. Singh batted with the style he has shown all season and while he added a very respectable 33 runs off 44 balls he couldn’t find anyone to stick around with him in the middle as a procession of NVCC batsman came and went cheaply – Tim Irwin (6 off 7), Leigh Ritchie (3 off 13), Adersh Maqsood (1 off 4), Dipen Modi (6 off 17), Scott Curwood (0 off 2), Pete Carson (8 off 14), and Rob Bolch (4 off 18). It was left to captain Peacock, batting at number 12 to add some respectability to the score as he knocked up a quick-fire 16 runs not out in just 21 balls that included two fours and some hard running between the wickets for a number of singles. Peacock’s efforts saw the NVCC to a total of 133 runs off their allotted 35 overs. After lunch provided by club sponsor Compadres, it was the turn of the Seals to chase as the temperature at the Expo topped 102 degrees. It was going to take a strong effort in the field from the NVCC team to restrict the Seals and a couple of early wickets gave them hope, albeit a false hope. With three wickets in the first five overs for NVCC where Mackenzie and Maqsood were kept busy – 2 wickets for Maqsood and a catch and run-out for Mackenzie – Peacock sensed that a couple more could swing the game in NVCC’s favor. It wasn’t to be however as the Seals middle order – Ben Dowdell (33 runs of 27 balls), Brad Busch (27 off 33), and Luke Ingham (39 not out off 25) – made sure that there was no way back for the NVCC. Peacock tried everything alternating between pace and spin with regularity. But his team couldn’t find wickets when they needed them and the Seals had three solid partnerships for wickets three, four and five that took the game away from NVCC. Seals wicketkeeper-batsman, Liam Saunders brought the match home in convincing style for the visitors with 14 off the last three balls – four, six, four – in only the 23rd over. Maqsood came close to a 5-wicket haul in the match returning figures of four wickets for only 14 runs off his seven overs that included one maiden (no runs scored) and Irishman Andrew Healy picked up the only NVCC wicket with Dowdell caught by NVCC keeper Pete Carson. 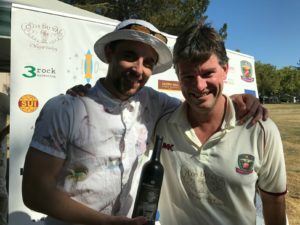 After the match the 19 Crimes Wine Man of the Match award was presented by Peacock to SF Seals Luke Ingham for his excellent contribution to the match with both bat – 39 not out – and ball – 1 for 21 off 6. 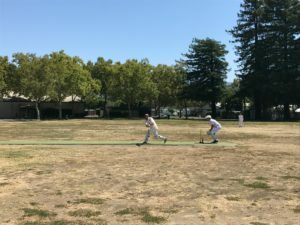 Napa Valley CC Bowling – Adersh Maqsood 4 wickets for 14 runs off 7 overs (incl. 1 maiden), Andrew Healy 1 for 25 off 3. Clos du Val, Anchor Brewing, Compadres Rio Grille, Crown Hill Stone Supply, St. Helena Optometry, Amcor, Azmera Consulting, Caliber Home Loans, 19 Crimes Wines, John Fearless. Lyve Systems Inc., Stone Universe, 3 rock marketing, Bill Wagner Realtor, Napa Gourmet Foods, ZAM Apps, Mechanics Bank, Tugboat.